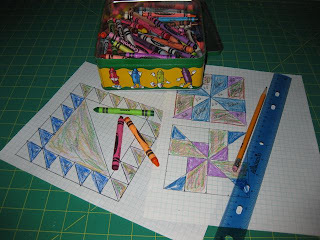 Sometimes I use graph paper and crayons to check the placement of fabrics on the Sampler blocks, especially when the pattern shows more fabrics than I am using or if I am running short of a color. 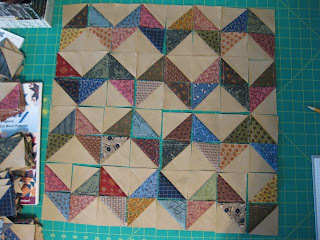 The other blocks in the sampler can be found here and here. 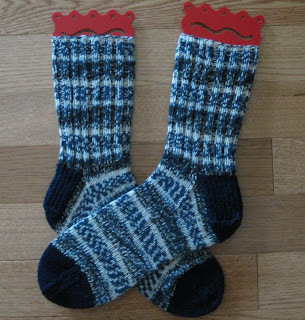 I am almost finished knitting the socks for my Christmas list. I have the final pair on the needles now for my niece. 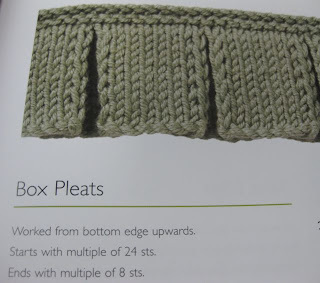 They have a bit of lace and are a bit fancier than these ribbed-cuff socks. If you want to do the Hokey Pokey, click here. 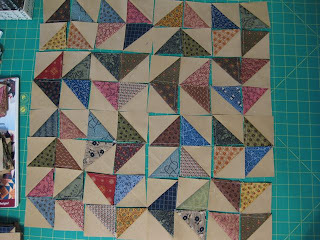 I've been auditioning more layouts for my half-square triangles, and I need your opinions. 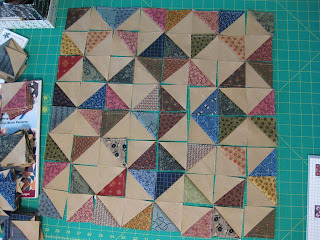 Please take into consideration that I will not be using any sashing between the blocks, so look how well they "play" together. 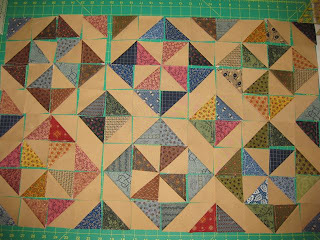 What is your eye telling you about these layouts? Any favorites? 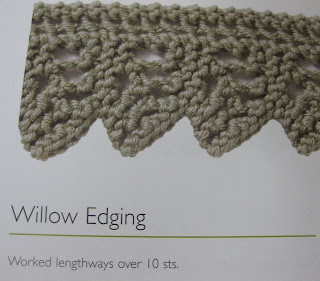 I've been searching for a book of knit edgings and trims since I added the edging to Little Princess. 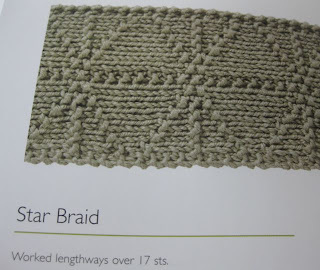 I've looked in yarn shops and online without any luck. 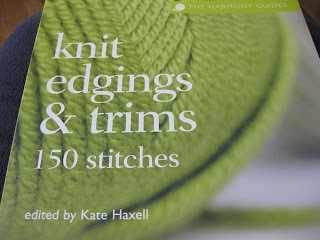 Last week, I found what I've been seeking: knit edgings & trims 150 stitches, edited by Kate Haxell. 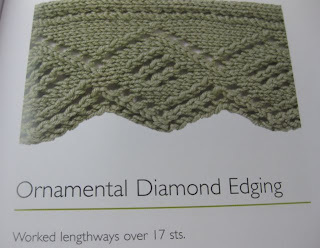 I like to actually look inside a knitting book before I purchase, and when I picked this one off of the shelf at Barnes & Noble in Cheyenne, I knew I could stop searching. 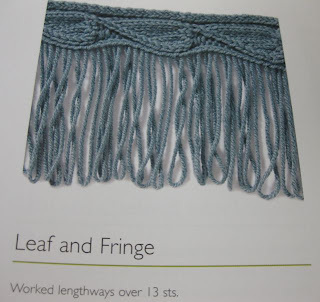 This book should be in every knitter's reference library. I also found a bargain on the Hobby Lobby Clearance rack. 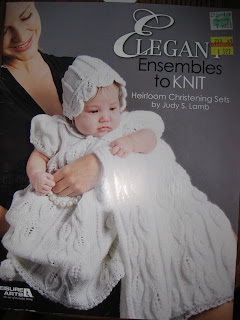 Someday, I hope to make one of the gown sets. 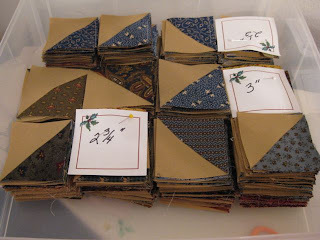 I've managed to work my way through the stacks of scraps from Scrappy Spools. Now, I need to decide what to do with them. 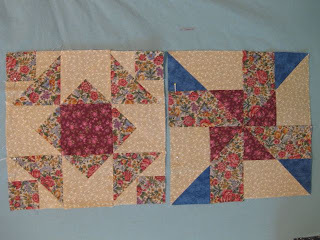 I have been thinking about making pinwheels, but I'm not quite sure. 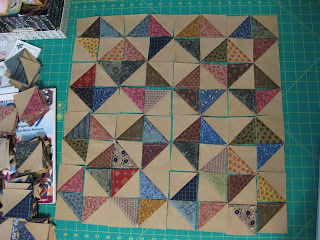 Other than pinwheels, this is another idea that I am considering. 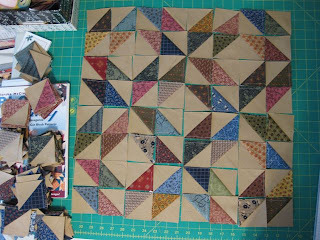 Do you have any suggestions for quilts made with half-square triangles? 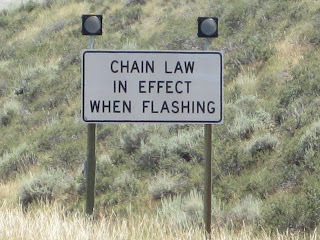 When I see these signs in the summer, I wonder how tourists interpret "chain law." Chain Law means that the road is hazardous (usually blowing and drifting snow with poor visibility and little or no traction) and that tire chains are required. These warning signs are commonly seen on Wyoming's mountain passes: this one is on the South Pass road where the grade is steep and drifting snow is frequent during the winter. Because road conditions can change quickly in the mountains, the flashing lights, only turned on in extreme conditions, should be heeded. Do you have signs in your area that might cause a tourist to ponder their meaning? 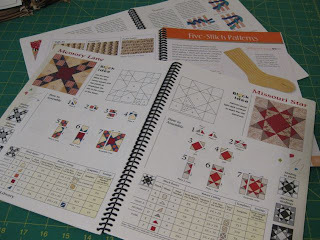 I strongly recommend having your favorite pattern books spiral-bound. 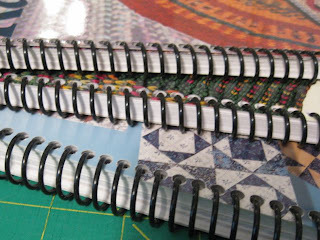 Most of the craft books (knitting, twining, and quilting) are soft bound.The books aren't too practical when I need to actually use them. 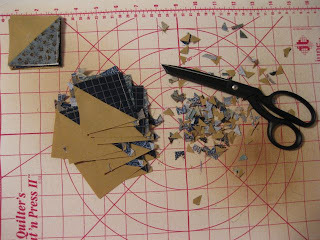 Often the binding becomes broken from my attempts or it slips all over the table or off of my lap. Once I discovered that I could have the books spiral-bound at Kinkos, my books are in better shape and I am much happier. 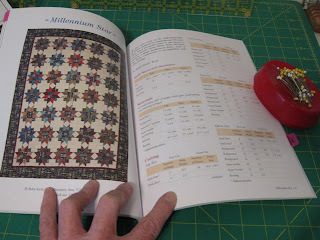 Personally, I wish publishers would produce these books with spiral bindings. Another pair of socks finished! 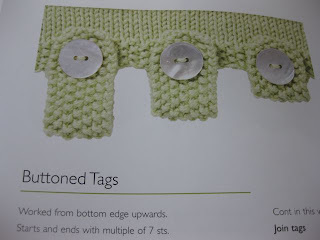 Unfortunately, they don't match, but I do have enough yarn to make another pair just like them. 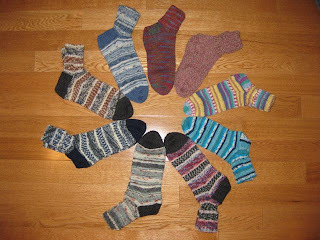 When the mates are finished, all of the men's socks on my gift list will be finished. I am pleased to report that in all five skeins of Opal, I found only one knot. 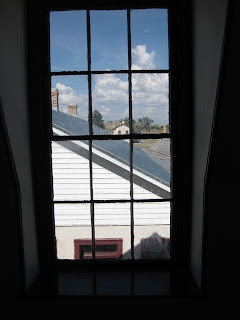 On Tuesday, I took a side trip to visit one of my favorite places in southeastern Wyoming: Fort Laramie. The last time I visited the fort was in the late seventies, but it hasn't changed other than some improved walkways, etc. 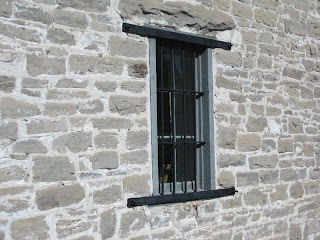 How many prisoners longed to be on the other side of this window? 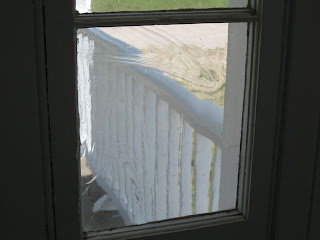 Most of the glass panes in the buildings had lovely swirls of imperfections. 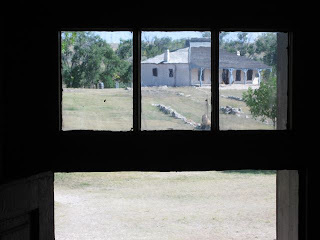 windows that revealed their surroundings and offered protection from the elements. 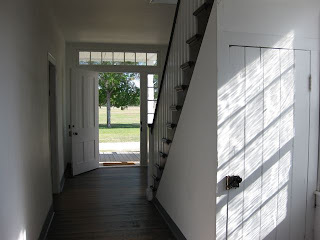 and stairwells with polished bannisters. 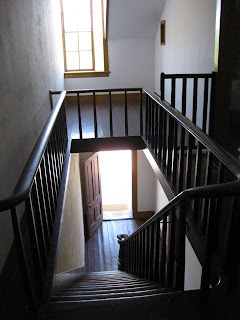 I imagine a sewing machine or a writing desk tucked in the little alcove at the top of these stairs. Windows frame what was, what is, and what will be. Are you getting tired of seeing socks? Only two more pair of men's socks to knit, but my sock yarn scrap bag is filling up. I see some short-cuffed sock knitting in my future. Thomas Wolfe said, "You Can't Go Home Again", but this week I tried. 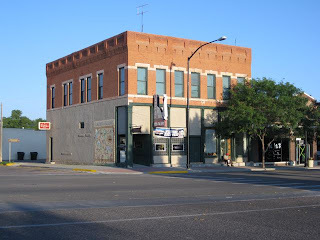 On my way to a Pulmonary Hypertension Support Group meeting in Cheyenne, WY, I planned a stopover in Wheatland, the location of my first real job and the beginning of my 33-year career in education. Ironically, as I drove down the eerily familiar streets, John Denver crooned on the radio, "Hey it's good to be back home again. . ."
It truly was good to be back home again. I slowly drove by the places I had lived 36 years ago (just putting that is writing is daunting and makes me feel ancient) and pulled over briefly to snap photos. 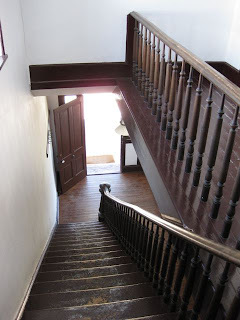 My first apartment was in the basement of an older home; the second, an apartment with a Murphy bed and steam radiators that made the doors swell shut in the winter. It was a good thing I was smaller in those days and able to squeeze through the windows. 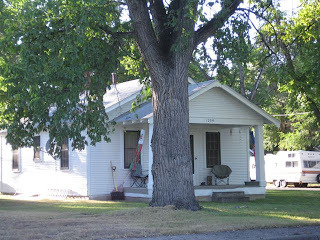 The small home (pictured above) was shared with another teacher, and finally I purchased a mobile home. Wheatland was home for six years: I packed more activity and fun in those six years than in all the years since. Many of the friendships I made during those years are still strong. 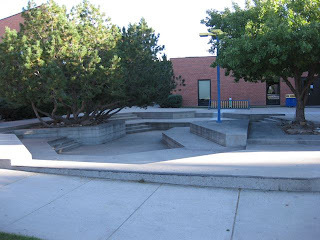 Everyone has moved on to other schools and other states, but our time at this location cemented our lives together. I wish that I had a photo of this building before the mural was repainted. The mural used to cover the entire side of the building. The Landmark was a frequent "watering hole" on Friday evenings. Memory has a strange way of warping reality. I didn't think I would have an opportunity to enter the school buildings since I would be arriving after school hours, but Fortune was on my side. I pulled over to take some photos of the building where it all began, pictured at the top of this post. As I clicked away, a woman exited and was clearly on her way home. She inquired if I had gone to school in the building, and so I began my story. Graciously, she asked if I wanted to see my old classroom, and for the next half-hour, she took me back in time. 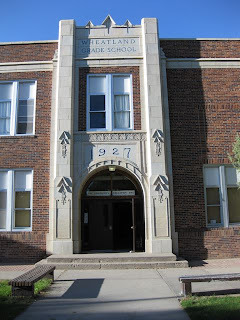 Wheatland High School was destroyed by a fire the year before I was hired and classes in the fall of 1973 were held wherever there was room -- church basements, above downtown businesses, meeting halls, etc. Classes were scattered all over town, and patience concerning tardies was a necessity. My second year I was still in the same building, but I was fortunate to have a real classroom. Sure it was an old elementary classroom and the chalk boards were knee high, but it had one door and I was not required to move things for game nights. 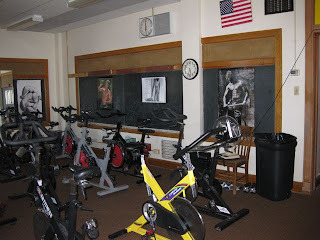 Since the building is now used for Community Outreach, my classroom now houses the Spinning classes. I wonder why I didn't think of hanging posters like that in my classroom? By my third year, the new building was progressing, and I was moved into yet another classroom. 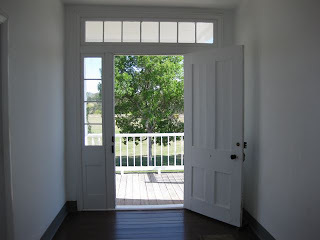 Although it was not in the new building, I loved this room. I had a bank of windows that faced south, and I filled them with Jade plants, Geraniums, and vines. 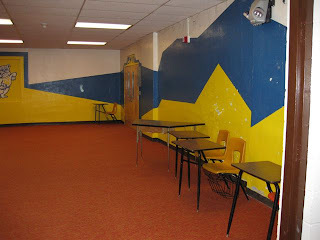 The other three walls were chalk boards and bulletin boards. I had built-in bookcases under the window. It was an ideal room. I really wanted to see the school auditorium since I was also the drama teacher. I spent a lot of time in that space, directing musicals, one-acts, and full-length productions, climbing the cat-walk, setting lights, and painting scenery. The auditorium door was unlocked, but I could not find the light switch, so I had to settle for the outside classroom where my students performed skits and plays. The trees have grown considerably. The new high school is actually a complex of separate buildings, almost like a college campus. 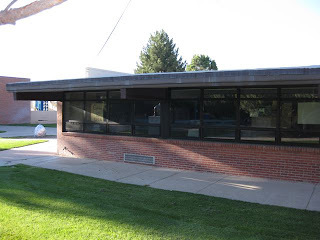 During the 1970's the campus had these buildings: agriculture, industrial arts, science, classroom, library, business, and the main building that housed the office, music, auditorium, gymnasium, art, and home economics. It appears that the fear of fire has dissipated, as some additions are now connected to the existing buildings. Wheatland has a special place in my heart. The town, the school, the parents, and the students made me the teacher that I later became. I am forever grateful for my six years in this special place, this place I am proud to call home.